It only strengthens the cry that Jibby should resign as PM as soon as possible. As much as I would love that to happen, I can’t stop but to wonder if it was really that Jibby did this or was he being framed up. Jibby is a smart guy no doubt, or else there is no way he can still be our PM despite we all wanting him out. So that got me thinking, if indeed it did take all those money, would he actually put it in his own local bank account? Shouldn’t he know that he could get easily caught? Instead why didn’t he open accounts in foreign banks or companies under a benefactor’s name and have the money channeled to him. I’m not sure it will work but it does seem smarter. 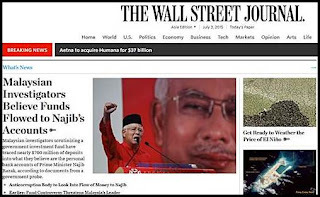 I’m not defending Jibby, but it just seems too good to be true. I smell foul here. More like a set up to have him overthrown as PM.Is it by Mahathir or Muhyiddin or the opposition? That is a question I don’t have the answer too. Now, what should Jibby do to rectify the situation? He needs to save his integrity in front of the world now. He needs to show Malaysian that they still can trust (as if we will ever do). He needs to save his career. If he did take the money, than god help him. On the other hand, if he did not take the money, well this is a top class political career assassination.I can only thing about one men in Malaysia who is capable to pull that off. This is what I feel Jibby should do if he did indeed take the money. No I won’t admit that I took the money, instead I would issue that this is something being framed up to throw me out. After some time, he should announce that he is stepping down as PM because he no longer feels that it’s best to lead the country under these circumstances. At least he would go out with some grace instead of being overthrown. After that he has to battle it out this allegation against him until a verdict is reached. Now let’s say Jibby did not take the money, this is how I would react if I was him. Come out with a strong statement condemning these allegations and file a case against The Wall Street Journal. Next try to identify if there is anyone within his party trying to overthrow him. Example try to find out if his DPM is trying to over throw him. If he is, try to get him sacked off that position and replace him with a guy who would support him as his DPM and continue to deny these allegations. Eventually resign as PM citing that it is not right to be the PM of this country with this kind of image. As the new DPM would be the PM and hopefully still supporting Jibby, he will eventually prove that this is a false allegation and have his reputation intact. Well politics is a dirty game and the sharpest and smartest will survive. This is how I feel Jibby should handle the situation. Well who I am to say this after all. I am just a normal citizen hoping that one day I would see my country be a leading nation that’s all.